XOXO contributor Florence is back with another installment of her misadventures in dating. Today we conquer the hardest question of all: Can you be friends with your ex? 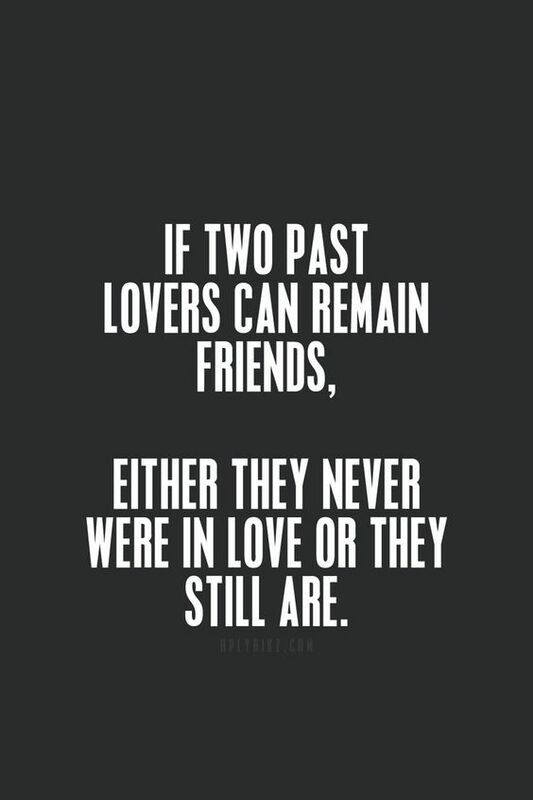 I came across a good quote when I was Googling inspirational memes that said something along the lines of, “If two people who once dated are still spending time together, they either still love each other or they never did.” At first I didn’t get it, but then I realized the other option would be that they’d loved each other at one point but stopped, and according to this Tumblr that was impossible if they were still ordering Chinese food and watching stand-up together on Friday nights. Which we were. Which we did this past Friday, too. No one in their right mind can navigate the murky waters of being friends with exes because no one in their right mind tries to befriend an ex. I have plenty of friends, thank you. If I needed a new one I would probably download that Bumble app, Friends Edition, not take a dip in the pool I already got naked in for other reasons. But since I am not in my right mind, as no one who is twenty-three or even twenty-four is, I’ve now found myself in the middle of that pool again. I have several ex-boyfriends from high school and college, none of whom I talk to except this most recent one whose parents I actually lived with for two terrible weeks when I first got a job in New York. He and I broke up shortly after that because what new relationship can handle the pressure of living with someone else’s parents? The actual break-up happened via Skype and was entirely my doing, which I’m very un-proud of. He’d already moved to Boston at that point, so I had no other options, okay? I wasn’t an angel, but neither was he and isn’t that always the case? This particular ex-boyfriend whom I would like to call Shawn, is funny, creative, and loves dogs but also has a tendency to be emotionally distant and childish (ironic, of course, since I was the one living with his parents). Since my recent move back to the Boston area we’ve spent a fair bit of time together; comedy is a shared interest, loneliness a shared state. This past weekend he came to visit at my parents’ house (where I shamelessly reside) and we had a lovely time walking the dogs, cooking dinner with my mom, and swimming in the ocean. We even saw a seal, which was adorable until we realized which vicious animal also thinks the seal is cute and has been spotted on nearby beaches. I felt about twelve the entire weekend, but not catty or hormonal, just imaginative and playful, the way I spent most summers as a kid. They say you should be with someone who makes you the best version of yourself, but I think that statement should be revised to say, “Be with the person who makes you the youngest version of yourself.” Maybe that’s impractical, but there’s something very lovely about feeling childish wonder and ease. At the end of the weekend Shawn said he’d like to date me, “at some point,” to which I stuttered and did not adequately respond. I mean, I’d like to go to Paris “at some point,” but I haven’t locked down a date and I certainly haven’t bought a ticket. The trip is a lofty idea I have, a fantasy that doesn’t take into account that Paris is expensive and besides that, I’ve already been there. While it’s comforting to know the streets and a few good restaurants, might that effort be better spent exploring someplace new? When it comes to exes, how do you know when to give up and when to give in?